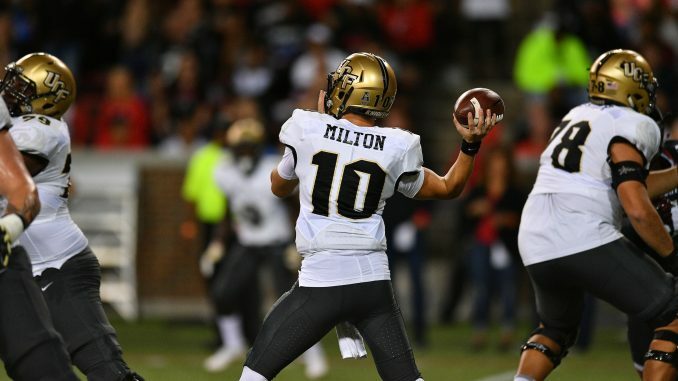 At the start of the 2017 season, UCF stated that it would wear a new color of pants during the year. But, those pants were never seen. It has finally been confirmed that, as many suspected, that color was gold. A UCF spokesperson confirmed that the Knights had planned to wear gold pants but were unable to due to a logistics issue. The first image of the pants surfaced on the Twitter account of Tyrese Black, a UCF commit who was sporting them in his signing announcement. The team has not yet determined if it will wear the gold pants next season, but it does officially have them as part of its combinations. That brings the number of possible uniforms the team can wear up from 64 to 80. The Knights had previously worn gold pants and jerseys for many years, dating back to before the George O’Leary era. But when former coach Scott Frost took over the program in 2016, the team redesigned, replacing the gold jerseys with pewter and anthracite alternates. UCF’s retired gold uniforms were not exactly well regarded, and the redesign has been practically universally approved of by fans, so it will be interesting to see how gold can fit into the team’s new look.